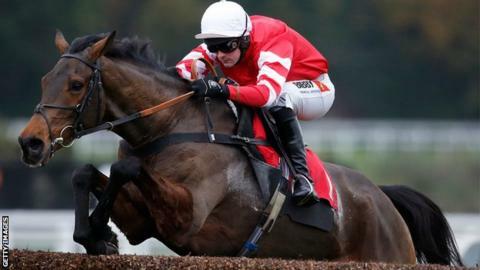 Coneygree warmed up for the Hennessy Gold Cup later this month with an impressive comeback victory at Sandown. The Cheltenham Gold Cup winner beat rivals Seventh Sky and Southfield Theatre on Sunday to claim his first win since taking steeplechasing's blue riband prize in March. Jockey Nico de Boinville guided the eight-year-old to a 25-length triumph. Coneygree, who is unbeaten over fences, will ride in the Hennessy Gold Cup at Newbury on Saturday, 28 November. "He felt great. We were in tight a couple of times and he shortened up well. He's just the same old Coneygree," said De Boinville.